A true Canadian pioneer in treating retinal diseases, Dr. Fareed Ali led the retinal disease division at OCC to perform the first intraocular injections of the anti-VEGF Avastin and Lucentis in Canada. He was also the innovator behind the development of micropulse laser technology, a safer treatment option for patients with dry AMD and central serous retinopathy. Today, the treatments initiated and created by Dr. Ali are among the most successful therapies used to treat retinal diseases in Canada and the world. 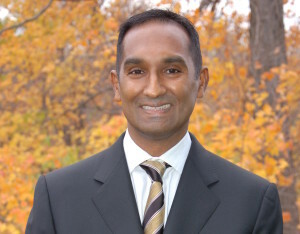 Dr. Ali, as Director of Clinical Research at the Canadian Centre for Advanced Eye Therapeutics, has performed numerous clinical trials with the FDA, Health Canada, and leading biotechnology companies. This work has led to the development and introduction in Canada of numerous new therapies and technologies for the treatment of a variety of retinal diseases. Dr. Ali’s experience also extends to his clinical focus in age-related macular degeneration, retinal vein occlusion, diabetic retinopathy, macular holes, macular edema, and all laser LASIK surgery. In December 2015 Dr Fareed Ali, the Toronto Vision Quest Chair, answered questions at an event hosted by The Foundation Fighting Blindness about age-related macular degeneration (AMD). Listen to the audio in the video below.